No parent should ever outlive their child. They definitely shouldn’t tear open their child’s chest while quoting a classic horror movie and hamming it up for the camera. As a long-time fan of the Mortal Kombat franchise, I have no problem with the franchises brutal signature finishing moves. The latest batch might be gorier than most, but they maintain the spirit of the horrible drawings I used to doodle of my classmates being stabbed, shot or run-over by steamrollers until they popped like sausage back in high school. Good clean fun, only without the good. Or the clean. But this round of Mortal Kombat introduces several new characters, several of whom has strong family ties to veteran fighters. 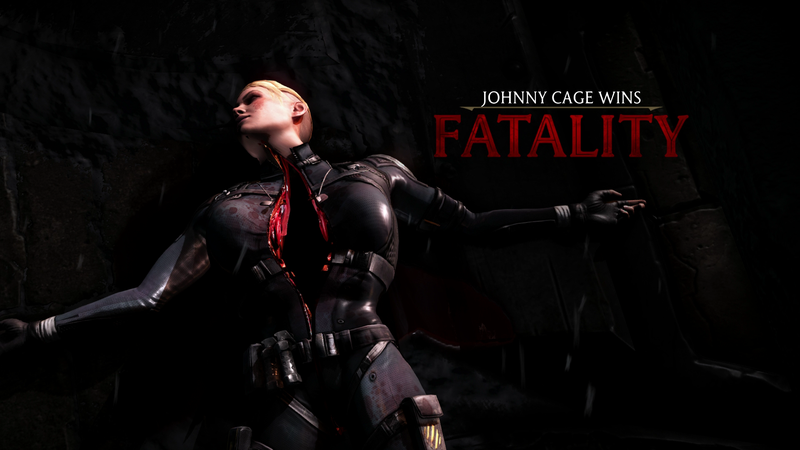 Take Cassie Cage, the daughter of Johnny Cage and Sonya Blade. It’s easy now that her loving father has slit her down the middle. Johnny Cage wins. Now there’s any number of story reasons that a parent and a child might be at odds. Demonic possession, childhood trauma, bad relationships and the like. One of the new game’s other children, Kenshi’s son Takeda, had a normal life with his mother before all hell broke loose, so not trusting his father to the point of doing something horrible in battle could be a thing. But in the case of Sonya and Johnny’s daughter, each battle begins with a little light-hearted (and unfortunately light-volumed) banter. They seem to have a great relationship. The kind of relationship I’d like to have with my children if the Earth is ever invaded by otherworldly supernatural forces. Maybe we’ll spar and train together to take back our planet. We certainly wouldn’t do this. Coupled with the familiar banter before the match, this just urks me out. It’s the same horrible feeling I had this morning, when Evan Narcisse and I faced off as Jax and Jacqui Briggs, the father-and-daughter special forces team. He can’t protect her forever, so instead he tears her head in half and uses it as an ashtray. I’m all for a good family-based rivalry in my fighting games, be it the good-natured competition between Bass and Tina in Dead or Alive or the not-so-good-natured competition surrounding Tekken’s Mishima clan. The difference is neither of those franchise get anywhere near as brutal as Mortal Kombat, where family game night involves a little Monopoly, some pizza and exposing each others’ innards. Now I’m not saying fighting game families shouldn’t murder each other. I just think they should have more motivation for it. Maybe telegraph it a bit more. Less friendly banter, more tearful “I’m going to have to rip your chest open now, baby.” That, or perhaps Netherrealm could craft family-specific “fatalities” that play off those relationships. with less gore and more humiliation. Nothing says an afternoon with your parents like humiliation. Maybe it’s just the dad in me. Mortal Kombat 9 came out in April of 2011, two months before the tiny men hiding in my wife’s stomach escaped. Perhaps witnessing their plight and growing close to them despite their squicky origin has changed the way I think about parent/child relationships. Just know that should we ever face off online in the guises of related pairs of characters, I will not use my gruesome fatalities on you, because we’re supposed to love each other. Also because I can never remember the inputs.